Hemorrhage is the most common cause of death among Special Operations Force (SOF) soldiers. Bringing remote damage control resuscitation into the far-forward combat environment is logistically challenging, as it requires blood products that generally require a robust cold chain. Alternatively, lyophilized products such as fibrinogen concentrate, which does not require thawing or blood group compatibility testing before use, might be advantageous in damage control resuscitation in the battlefield. In this report, we review the evidence for the use of fibrinogen concentrate in the Canadian SOF environment. 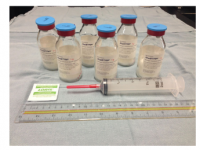 The literature on the use of fibrinogen concentrate in the trauma setting was reviewed by Canadian Forces Services Working Group, in three separate meetings. Multiple stakeholders were consulted to obtain authoritative perspectives from subject matter experts on the use of fibrinogen concentrate in the Canadian SOF environment. We also conducted a comparison review of fibrinogen content, pathogen risk, shelf life, and methods required for use for fresh frozen plasma, cryoprecipitate, and fibrinogen concentrate relevant to their application in the far-forward combat environment. Indications and a protocol for the use of fibrinogen as an adjunct to fresh whole blood were formulated based on a literature review and clinical expert opinion. Alternative strategies and other lyophilized blood products were considered before selecting fibrinogen concentrate as the lyophilized blood product of choice. Fibrinogen concentrate is an ABO-universal blood product with an excellent safety profile. Training was conducted by subject matter experts within civilian trauma centers and at military training facilities. The clinical efficacy and safety were confirmed by monitoring the use of fibrinogen concentrate in deployed combat settings.